Want to Learn About Jack the Ripper? Skip the Tour. My original plan had been to sample at least two Ripper Tours while in London, but after running into 6 other tour groups on my maiden voyage, I decided it wasn’t necessary. The groups ranged from 12 members to more like 40, and they all (unsurprisingly) were stopping at the same places. One group was headed up by a vintage bobby, my guide was in waistcoat and hat, and others were dressed in normal street clothes. I knew there would be at least a couple other groups around but this was nuts, especially considering there was hardly anything to see. That area of London had suffered a great deal during the London Blitz of WWII, so there weren’t really any historic buildings left standing, so the tour meant walking through a long street lined with curry restaurants and maneuvering around construction zones. By about 30 minutes in, the Mister and I were joking that we should have just stopped at the beginning for curry instead. 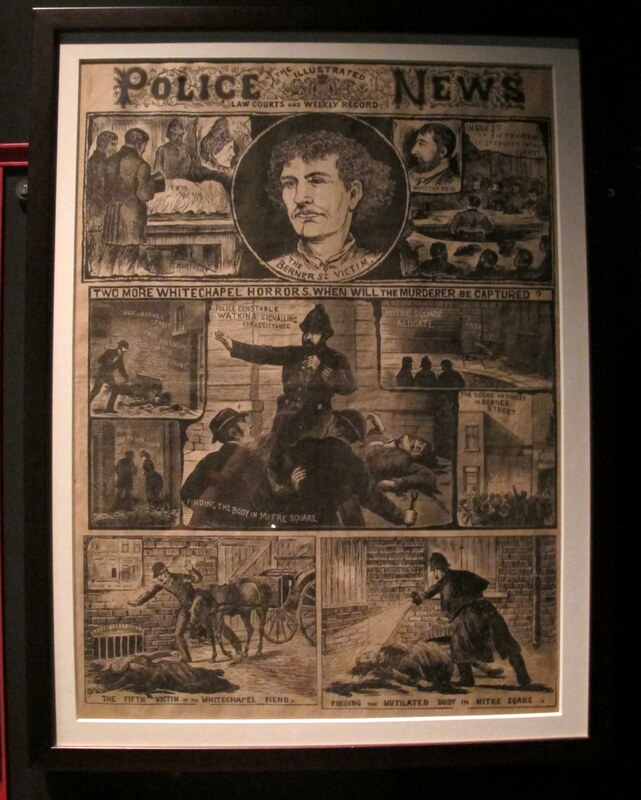 I was on a tour using what they called “Ripper Vision” and some large historical photographs to try to enhance the experience, but it still fell flat for me. Ripper Vision consisted of a handheld projector that the guide used to show photos of the victims and newspaper stories from the Ripper days, but he couldn’t keep the projector steady so I ended up actually feeling sea sick from all the jerking around and had to look away. The guide was well-versed in Ripper lore, but without any real sites that still looked like they did during the Victorian era, it definitely could have been a lecture in a hall and saved my feet the trouble. If you want to learn about Jack, I’d say get a book. I’ll be writing a Jack the Ripper Steampunk Sourcebook article for my ezine which will be available around Christmas time, and will not only look at the history and mystery surrounding the murders, but also Jack’s appearances and role in Steampunk so far. Have you ever read any Steampunk fiction or seen any good movies that featured Jack the Ripper? Do tell! This entry was posted on September 8, 2014 by Phoebe Darqueling. It was filed under History, Museums and Exhibitions, Steam Tour, The City of London, Travel and was tagged with Guided Tour, Jack the Ripper, Jack the Ripper Tour, London, Museum of London, Ripper Tours, Ripper Vision, Sight-seeing, Tour, Travel.